Soaring ceilings and perfect lighting characterize the airy space of the Gift Shop. It's the perfect backdrop for an exquisite collection of local temptations chosen with style, humour and an eye for the unusual. In the Gift Shop you'll find Finnish crafts like Lapland hats in a hundred different colours. A selection of local semi-precious stones fills one case. 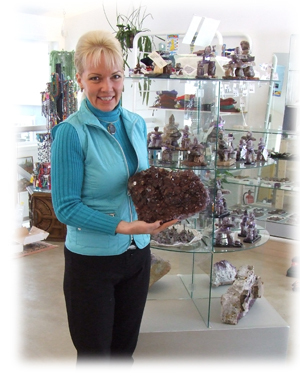 Another displays an amazing collection of amethyst specimens from local mines. Hand-carved furniture for the garden or sun room graces a corner by the window. Whether you're looking for a gift for someone special, a keepsake from your visit to the North Shore or an attractive addition to your lifestyle you'll find plenty to tempt you in the Gift Shop.